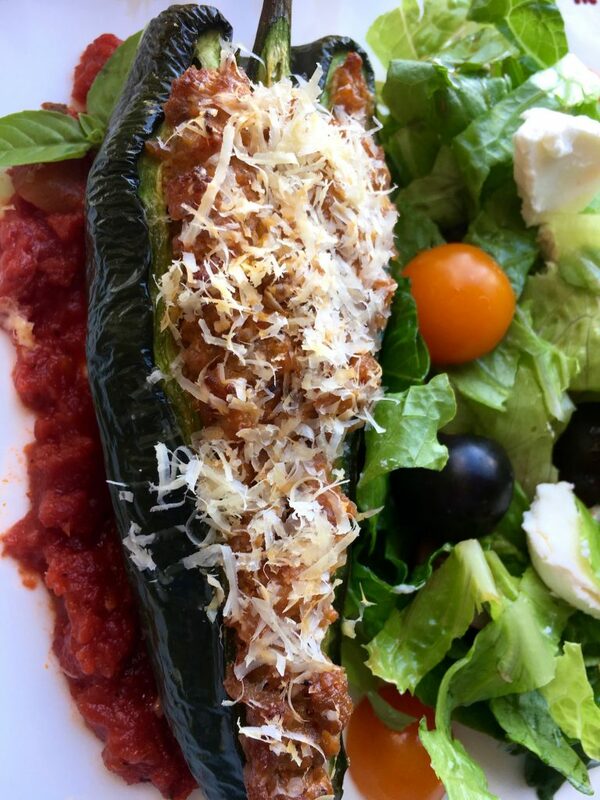 Here is my Keto Chorizo Stuffed Pepper side dish recipe, that is a perfect accompaniment for grilled meat or fish. Personally, I hate raw peppers even though they are a great low carb salad vegetable. And I know others love them. I find however that cooking transforms a pepper into something quite different from the raw version. Lovely and sweet tasting. 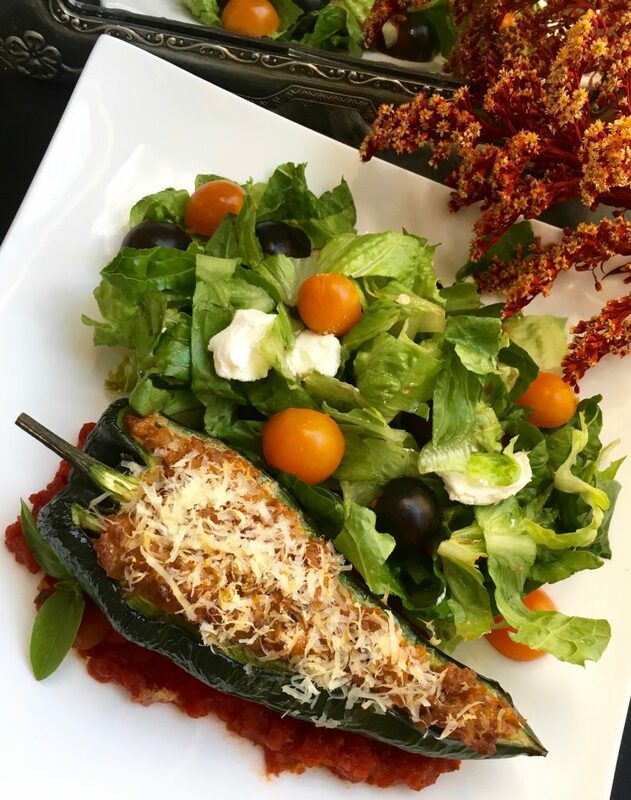 You won’t believe how quick and easy these tasty stuffed peppers come together. You can have this delicious, low-carb side dish on the table in just over half an hour without much fuss because the spicy Chorizo sausage delivers a ton of flavor without adding a lot of other seasonings. As an added bonus, these peppers freeze extremely well, so you can easily double or triple this recipe for even faster weeknight meals later. Although this dish has been posted as a low carb side dish idea, a larger portion size would make a lovely light lunch. 1. Preheat oven to 350°F/180C and spread tomato sauce across bottom of baking dish that the peppers will fit into snugly and upright. Set aside. 2. Cut Poblano peppers in half lengthwise, leaving stems intact on one side. Remove seeds and set aside. 3. Brown Chorizo in a large frying pan over medium-high heat, stirring occasionally, until no longer pink and the egdes are a bit crispy. Remove from heat and drain excess fat if there is a lot of fat otherwise keep the fat as it is really tasty. 4. Add cream cheese, goat cheese, and half the Parmesan cheese into frying pan and stir until cheese is melted and the Chorizo sausage is thoroughly coated. Season with salt and pepper, to taste. 5. 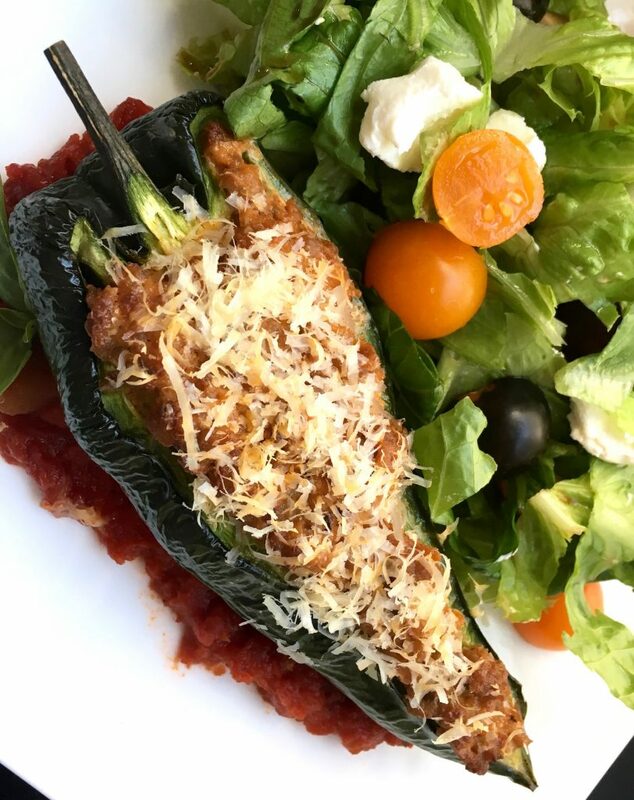 Carefully spoon sausage mixture into empty Poblano pepper halves and arrange in the prepared baking dish and sprinkle with remaining Parmesan cheese. 6. Place baking dish in pre-heated oven for 25-30 minutes, or until cheese is melted and peppers are heated through. Remove from oven and serve immedialty.